You are here: Home / Recipes / Snacks & Treats / Cookie Recipes / Sugee Cookies – Makes Melt-in-Your-Mouth Magic! Sugee Cookies – Makes Melt-in-Your-Mouth Magic! 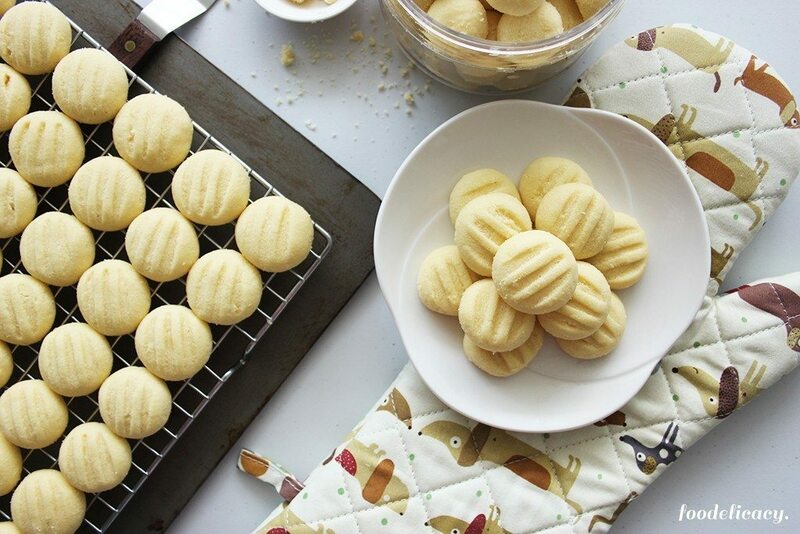 Sugee cookies are very light, crumbly, oh-so-very-buttery, melt-in-your-mouth cookies. These are festive favourites, but perfect treats for everyday tea. I can’t possibly start my Lunar New Year without sugee cookies! 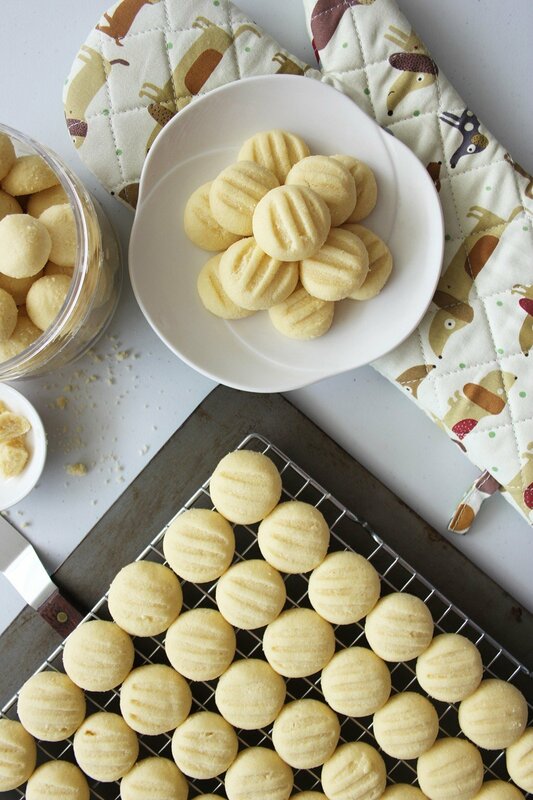 My festive baking this year has seen better progress than most, with lapis cakes and pineapple tarts all done, and now, with just three more days to the start of the New Year, I quickly get to baking these light, crumbly, and oh-so-very-buttery ghee cookies. 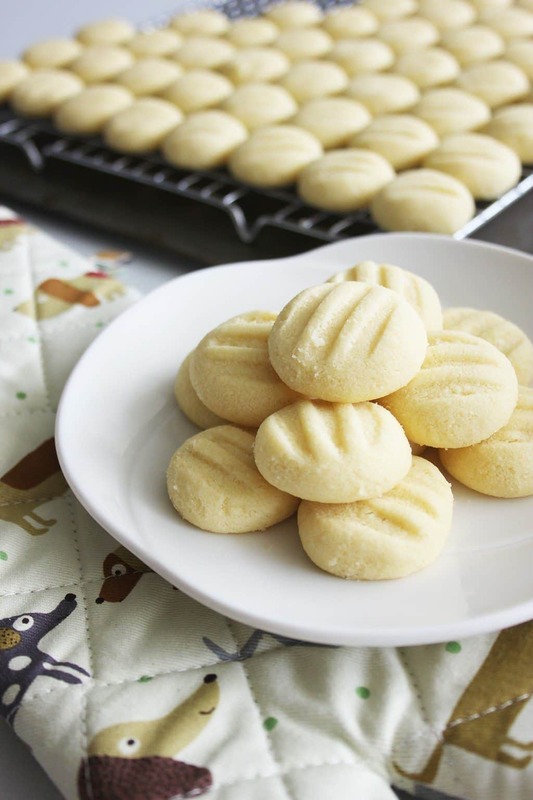 Sugee cookies are like a very lightweight version of shortbread cookies. Biting into a sugee cookie, you first feel a crisp crunch, and the cookie quickly breaks into crumbly morsels, releasing an intense buttery flavour (as ghee is used instead of butter), and it all literally melts in your mouth. It’s a sublime way to enjoy a cookie, don’t you agree? 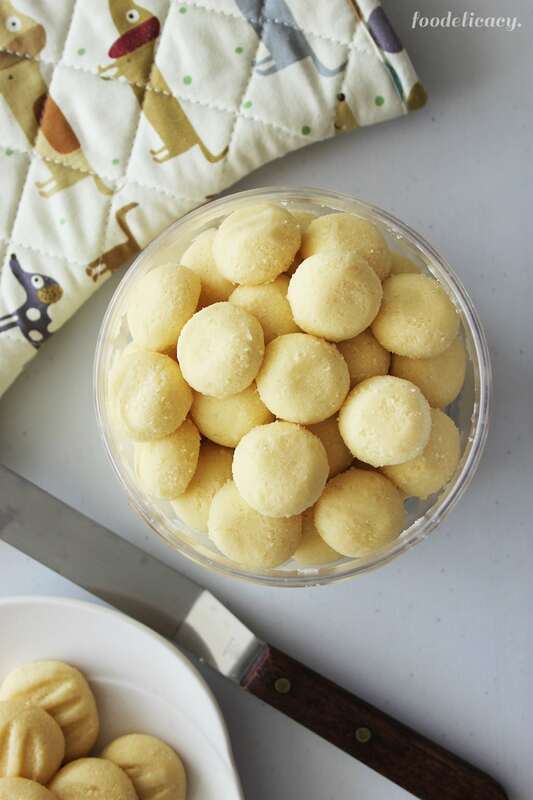 Sugee cookies are very easy to bake (yes, believe me – finally, here’s a Chinese New Year goodie that doesn’t have to test our baking skills to the hilt!). These cookies tend to have characteristic cracks in their appearance, and that’s due to the action of baking soda when mixed into the cookie dough. 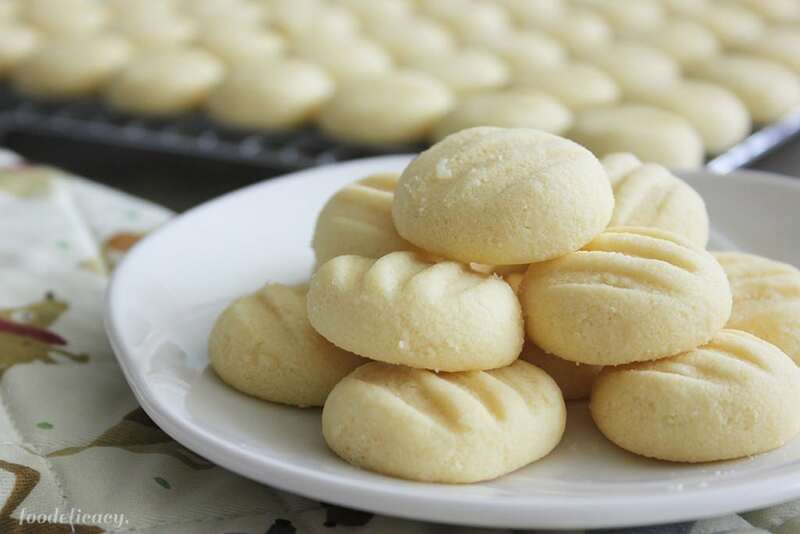 I tend to defer to traditional Nonya recipes like this one by the late Mrs Leong Yee Soo, which uses the simplest of ingredients, and omits the use of baking soda. 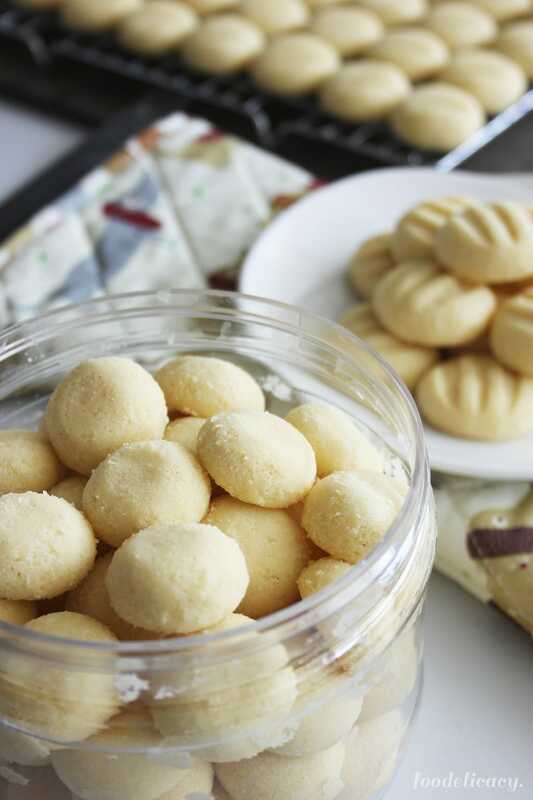 But if you just love those surface cracks in your sugee cookies, mix in 2 to 2 1/2 tsp of baking soda with the flour, before adding to the ghee mixture. Then proceed as per the recipe instructions, and shape into rounds without making impressions. Perhaps, the only challenge you’re likely to face is the temptation to over-bake these cookies, and trust me, it’s easy to over-bake these. You’ll tend to want to see the cookies brown a little, as most cookies and biscuits do, but these cookies should turn lighter, to a pale cream colour when baked (and I know that this might go against every impulse or instinct you have as a baker). If they are over-baked, these cookies become hard, crispy and crunchy, though still delicious, and are perfectly edible. If baked to a pale cream, these cookies will give you that full buttery taste of ghee, and that much sought after, characteristic, melt-in-your mouth texture. In an electric mixer fitted with a paddle attachment, cream ghee confectioner's (icing) sugar, essence, and salt on medium speed for 5 minutes. Change to a dough hook attachment, add the flour, and knead into a soft dough. Leave covered for 4 hours. Pre-heat oven to 120 deg C (250 deg F). Line baking trays with greaseproof paper. Using a teaspoon, scoop a heaped teaspoon portion of dough and roll between your palms into a ball, each the size of a marble. Place on the baking tray, spaced well apart. Using a small fork, make impressions by pressing lightly on the centre of each ball, and sliding the fork away from the centre to prevent sticking. 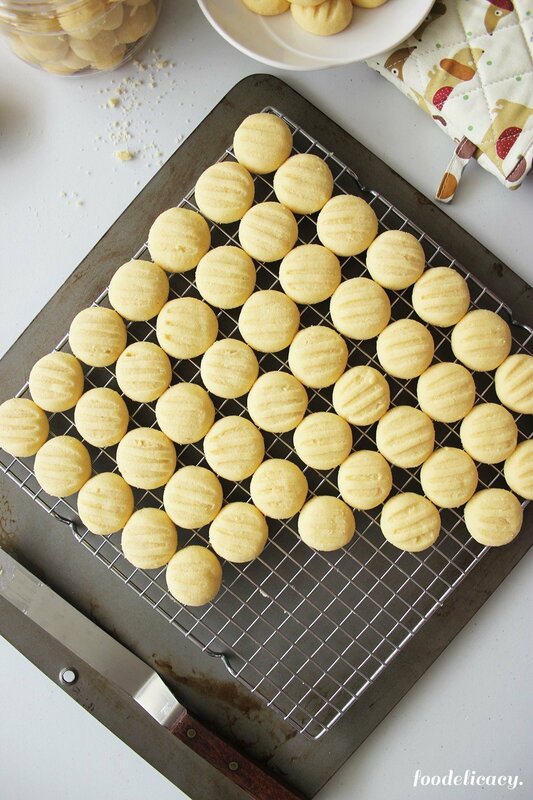 (For round-shaped cookies, roll into balls, and press lightly in the centre with your finger). Bake for 20 - 25 minutes, until cookies turn lighter in colour. Transfer to a cooling rack. When completely cooled, store in airtight containers. Previous Post: « Pineapple Tarts – Treats for Festive & Everyday Occasions. Hi Jing, I’ve never left this cookie dough overnight but it should be fine, as the dough doesn’t contain eggs or dairy. I would keep it covered in a dry, cool place. Hope you could share how it turns out! Happy baking! Hi. Can i leave the dough overnight? Hi Kavan, there is no semolina flour in the recipe which I realise is odd for these to be called sugee cookies. It’s how the original recipe was presented and I didn’t feel the need to tweak it then as these cookies really do turn out awesome and have that melt-in-the mouth texture. First time baking cookies and i love the outcome. QBB ghee brand is a must. I used regular cake mixer to blend ghee and sugar then kneaded flour in by hand till dough got nice and even. Rested dough for abt 3 hours. Cookies were smooth, no cracks, and yes that oh-so-buttery-melt-in-the mouth feeling…100% must try sugee cookies recipe, thanks to Celia. No sugee for this recipe? Hi Amelia, sorry to hear that. I’ve not encountered this before but my immediate thoughts would be that it’s possibly a case of over creaming the ghee. Do not replace icing sugar with raw sugar as the texture will turn out differently. Cookie dough, when rested enough, allows the flour to become coated evenly with the fats and gluten (protein) in the flour to relax, so that the cookies can have the melt-in-the-mouth texture. Resting also allows the flavours to develop better, so the cookies will taste nicer. Hope this helps!